For those keep score,,, that's four boys and one girl. he is certainly very floofy! he is just too pretty to be a 'he'. I can't believe how different these 5 all look from each other... all cute, and all unique! What a beautiful litter! This little guy has that adorable concerned/earnest/serious look that some kittens get - love it! How is it that each litter is comprised of the "cutest ever"? I can't wait to get to know each of these beautiful babies by name and do so wish I lived about 3,000 miles nearer. Four boys and a sister to keep them all in line. I love it. oh isn't he sweet and fluffy! Love his diluted orange color. How on earth do you get the all these precious kittens to pose for you? The photography is amazing. Oh, so beautiful! He just kills me! I can tell that this fellow is a deep thinker. Reads fine novels. Eschews television and other black holes of popular culture. Enjoys a good pinot noir, but not if it's too oakey or woody. Appreciates the sensory and philosophical appeal of the sparkle ball. Plus, he's CUTE as all heck!!! Hello there floofy knickers. Would you like to come and live in England? OMG, he looks so sweet! And soft! This litter is killing me with cuteness. Can't wait to get to know them all better! What a cutie! Can't wait to learn all their names. Ahhh too cute for words! He has both the innocent and the "come hither" eyes. Oh my, he is going to grow up to be a beautiful, big peach tomcat! A creamcicle kitty! Such a handsome boy! How is that with each cat you introduce, I think nothing can be more precious and beautiful, yet you always manage to top each picture?? This little creamsicle is gorgeous! Ooh a Buff and White kitty!! Just like my 7 year old "kitten" Alpine. I love his big floofy white paws. Laura, I've occasionally wondered whether the HS slips one in from another bio-litter, just to make up the numbers! This bunch has really fantastic noses! He is oozing floofiness from every orifice! I've been following for a long time now, but this is my first comment. I just couldn't resist commenting on this guy. He's ADORABLE! Can't wait to find out their names and see more pictures of this group. They're all so unique! It is clear that, like love, cuteness is infinite-- each kitty just gets cuter and cuter without ever reaching a limit. I may or may not need to get one of my math-y friends to explain this in quantam physics. That pink nose is killing us, such a good place to place a kiss,love, we have it. 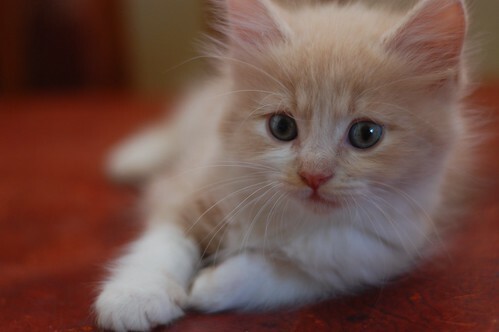 O God, I want a kitty just like that or I shall surely perish and die. Or ... you know. He's just too cute, I've been staring at him in regular intervals since you posted that picture and it cheers me up every time. I hope you'll post the picture of him with his wet-down hair, looking like his mama just spit on her fingers to fix him for his close up. Can I guess that Charlene is doing a happy dance, cuz it's not a whole litter of floof this time? Poor miss Callie, she is sorta outnumbered by all those brothers. And Pooooooor Miss. Bean, no rest for the weary, is there? Hang in there Beanie!!! Oh my, four boys and one girl! Wow! Today is my birthday and looking at these photos just makes my day! Thank you Laurie!! That little bit of a thing is "rough and tumble"? Oh my doodness! It must be those bad brothers!